Now that the year is over for stocks, we updated this chart that we did last year that shows the percent of stocks in the S&P 500 that were down for the year, the % that were down more than their sector, the average change of all stocks in the index, and the average change of down stocks. 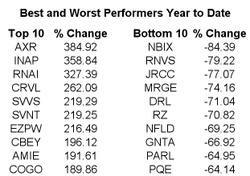 This year is unique in that there was a higher number of stocks that underperformed their sectors than in previous years, even though the average stock was up 13.37%. This implies that the larger stocks in the sectors were the ones outperforming. With so much investor attention being focused on seasonal patterns over the last few years, we wondered what impact, if any, this had on the actual patterns themselves. In order to gauge whether the patterns of the last fifty years are as strong today as they were several years ago, we calculated the average forward three-month return of the S&P 500 on each day of the year from 1950 through 2005, and then again using only the years from 2001 through 2005. As the chart highlights, there appears to be some evidence that traditional patterns are moving up on the calendar. 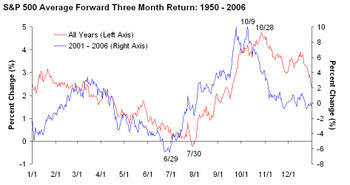 For example, the summer doldrums usually ended on July 30th when the average three month forward return briefly dipped into negative territory. Over the last five years however, the worst three month period for the market has moved up the calendar and now begins on June 29th. Similarly, the best three month period for the market used to begin on October 28th. Over the last five years however, the best three month period for the market has started coming a little earlier (October 9th). Applying these trends to today, we find that longer-term, the market’s return over the next three months averages about 2%. Over the last five years however, as more investors have anticipated and positioned themselves for the Santa Claus and New Year’s rallies, the market has become less generous, as average returns are now flat. Traditionally, whenever the stock market closed for extenuating circumstances, each of the major and regional stock exchanges (Nasdaq, AMEX, etc.) looked to the NYSE for guidance. Often times, spokespeople for the Nasdaq would say they would follow the lead of the NYSE's decision. Now that the NYSE is a publicly traded for profit company, it appears as though times have changed. At 17:52 this evening, while the NYSE still reportedly had yet to make its decision, Nasdaq took the lead and announced that it would close for trading on January 2nd in honor of President Ford's Funeral. This will mark the first time since the 9/11 attacks that the Nasdaq will be closed for trading for four consecutive days. 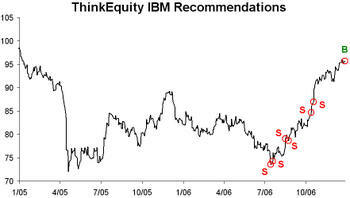 Bloomberg surveys a number of equity analysts on a weekly basis for their S&P 500 price forecasts. 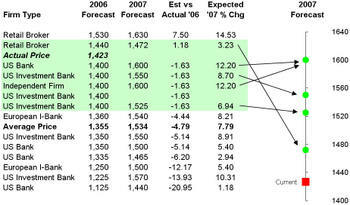 Below is a list of their most recent 2007 year-end price forecasts for the S&P 500 (actual firm names are not listed). Based on the average forecast for 2007, the Index is expected to rise 7.79% from the current price. We've also included what the analysts' calls were for year-end 2006 and how close they came to getting it right (based on current price levels). While the consensus for 2006 was an expected gain nearly 5% lower than where the S&P 500 currently stands, 6 analysts made calls within 2% of the actual 1425 level. 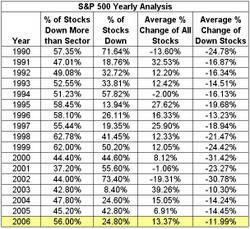 We have highlighted these in green and also show that they are all expecting further gains for the Index in 2007. For much more info on the expectations for the coming year, check out our Global Outlook 2007. Be sure to check out Ticker Sense's Paul Hickey on CNBC today at 2 PM ET. He will be discussing the outlook for stocks in 2007 among other things. 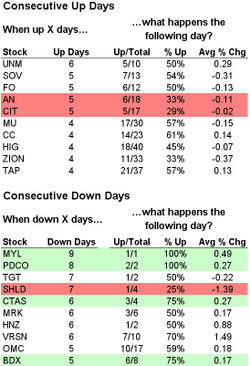 Below is a list of the S&P 500 stocks that have been up or down the most consecutive days. 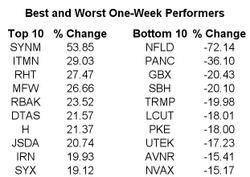 Stocks highlighted in red have performed poorly following times when they have had similar streaks. Stocks highlighted in green have performed well. We just finished up our Global Outlook 2007 piece, and it has been sent out to our current Mini-Institutional subscribers. The report covers everything investors need to know about the consensus outlook for global markets, stocks, economies, earnings and commodities, with an increased focus on the US. To name a few, we highlight which sectors look the best in 2007, which countries are expected to have the largest gains, and which individual stocks are liked most. Usually only our Mini-Institutional subscribers would get this report, but we are currently offering it to anyone who signs up for a yearly Newsletter subscription as well as any current yearly Newsletter subscribers. So sign up securely here and we will email you your own copy of our Global Outlook 2007 today. 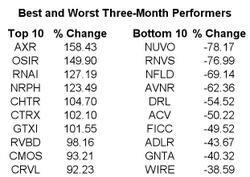 The tables below highlight the best and worst performing stocks in the Russell 3000 over the past 5 days, the past 3 months, and year to date. 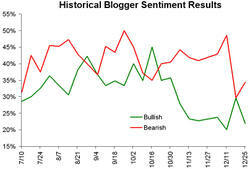 Financial bloggers showed increased neutrality this week. 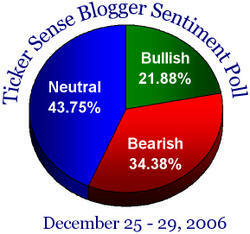 The Blogger Sentiment Poll will take this week off due to the shortened work week. We'll pick back up in 2007!